Signed by Jules David, a prominent French painter and lithographer, who introduced naturalistic situations to fashion illustration. 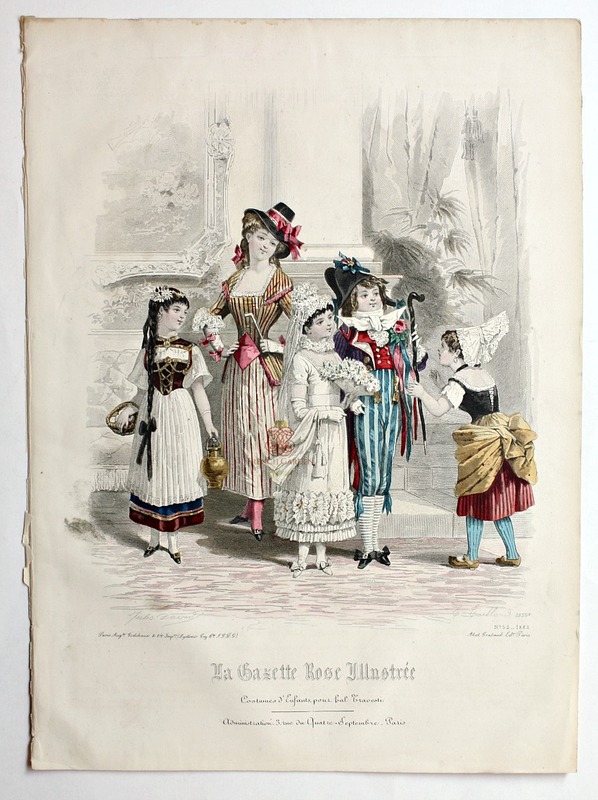 Colored with bright water colors, this print shows a group of children , each wearing a different Carnaval or Mardi Gras costume in white, pink, yellow, blue, wine and red colors. The detail is gorgeous, their clothes resplendent in silks, laces, satin and velvet, and then the hats! Each is an original work of art. To be expected in prints of this age, there may be a few characteristic areas of foxing etc., this print is in beautiful antique condition. Perfect to frame, loves the company of others. Display in a grouping, these rare decorative prints make a stunning statement! Measures 14-1/4" x 10-1/2".